"A dish made in half an hour! Plump shrimp are sauteed quickly and then simmered in coconut milk infused with garlic and ginger. Serve with white rice and steamed broccoli for a luscious quick dinner." Combine the garlic, ginger, jalapeno, salt and turmeric in the container of a food processor or blender. Process to a smooth paste. Set aside. Heat oil in a skillet over medium heat. Add onion, and cook until translucent, stirring frequently. Mix in the spice paste, and cook for a few minutes to release the oils. 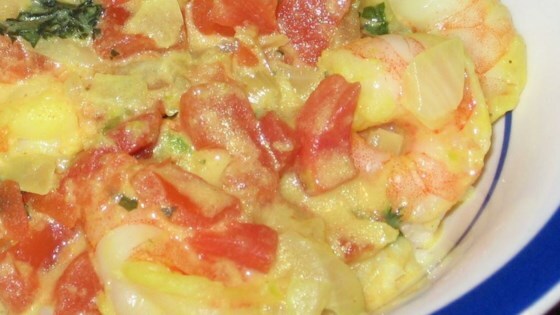 Add shrimp, and cook for a few minutes until pink, then add the tomatoes and coconut milk. Cover, and simmer for about 5 minutes, then remove the lid and simmer an additional 5 minutes to thicken the sauce. Stir in the fresh basil during the last minute of cooking. See how to make a kicking Thai-inspired marinade for grilled shrimp. this is my favorite dish to cook. i substitute the turmeric with ground cumin, simmer at a higher temp for thickness, and serve over rice. good stuff. a nice and simple dish. i found it very satisfying!